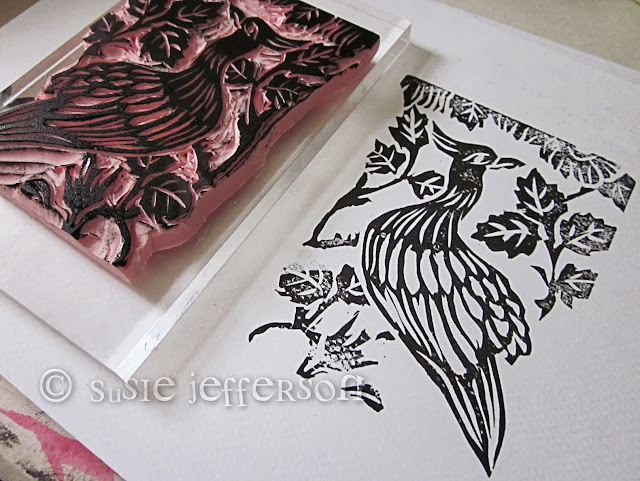 I thought you might like to see what I did with the stamps I carved. I had a whale of a time - the cards just kind of made themselves! 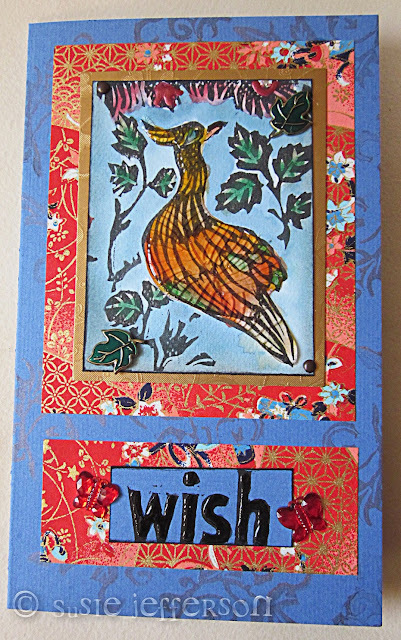 I used Japanese origami paper for the background layer. The folded blue card is stamped with another of my carved images - a floral - which is stamped repeatedly with Brilliance Cosmic Copper ink. I've coloured the entire image with watercolours and added two leaf-shaped brads. 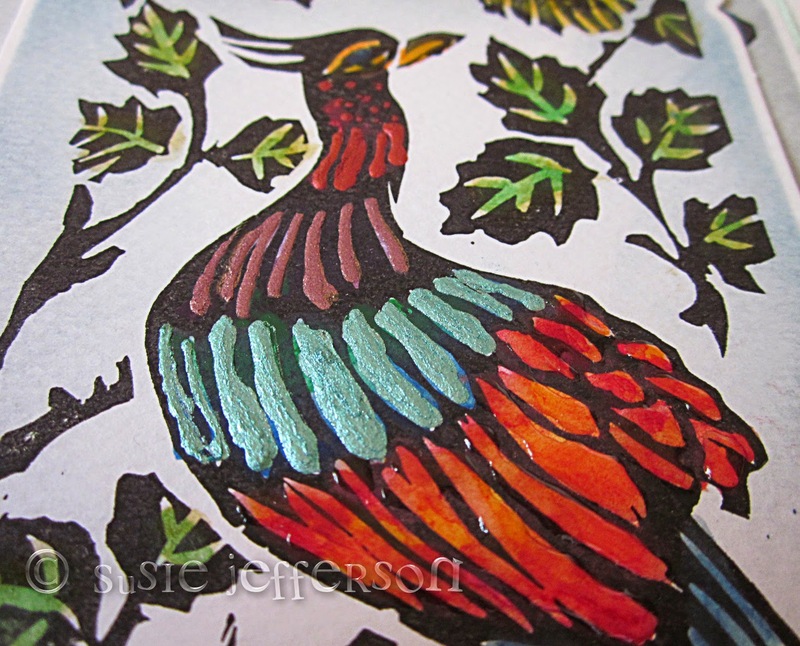 I covered the bird itself with a really heavy coat of Inkessentials Crackle Accents. 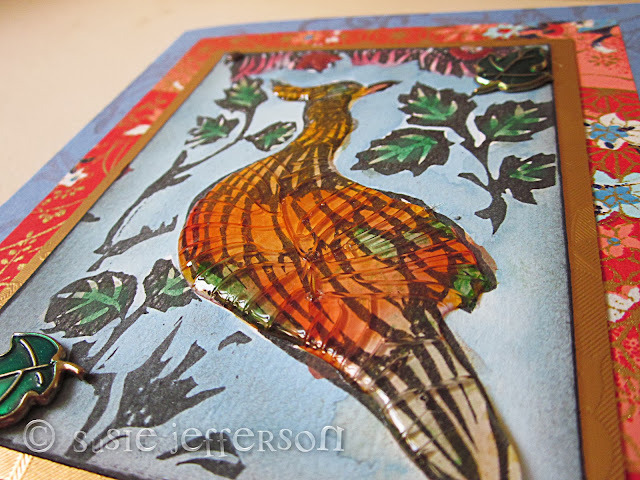 To make such a heavy crackle (this reminds me of a tray of toffee hit with a hammer) draw around the outside edges with the fine nozzle, then flood the middle with the Glaze. Make sure the card is totally flat, as this stuff is self-levelling. I also advise leaving overnight to dry. Closeup of the word 'wish', which I also carved. I've added a layer of Glossy Accents to show this up even more. This one uses Glossy Accents to pick out the feathers on the wings, and Sepia Accents to show up the petals on some of the flowers. 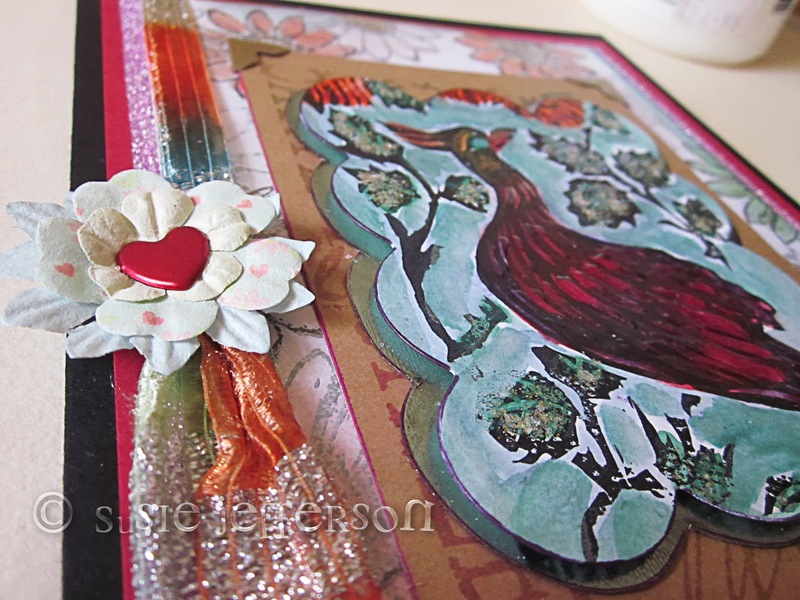 I've also added lots of Stickles glue to give a little sparkle. Another view. 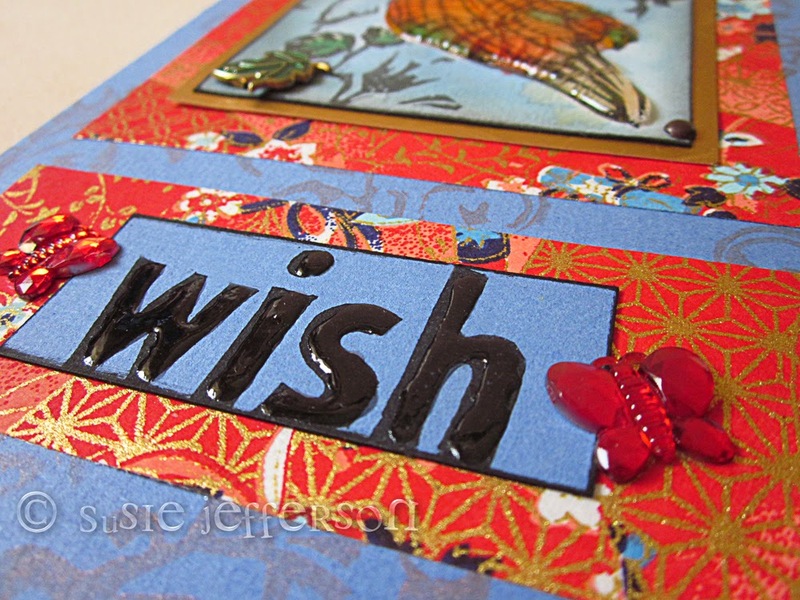 You can see the Stickles glitter on the leaves. Paper flowers are layered with a heart brad, and fixed on top of Sari ribbon. 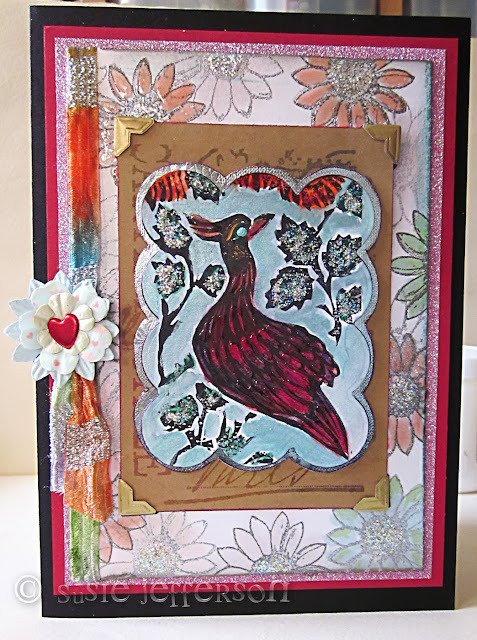 The bird is cut with a Spellbinders die, layered on another Spellbinders-cut layer, and matted to a kraft card stamped with a Tim Holtz postoid. I've also added kraft photo corners. A very simple card, with two layers of die cuts mounted to grey pearlised card, in turn mounted on white watercolour paper. The most traditional card of all of them! 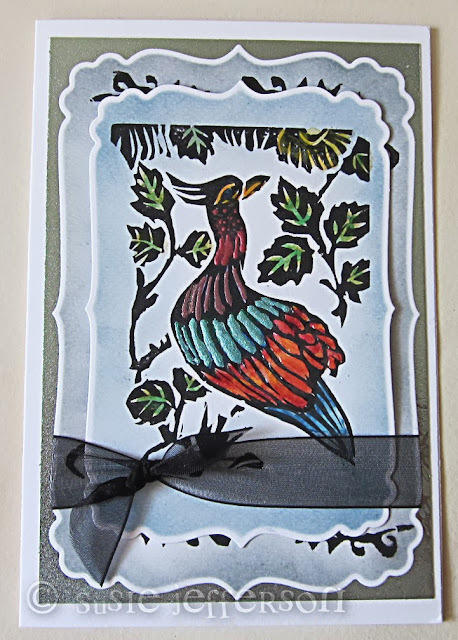 I've used Distress ink to shade the edges of the card, cut with an X-Cut die which I left in place while I added the colour, so I'd have that white edge. Here, I've used Lumiere paints on the neck, in copper, bronze and turquoise. The red feathers were watercoloured and I added Glossy Accents on top. Fun, huh? And so different once a little colour was added! Wow Susie, your talent to carve your own stamps is a blessing and beautiful turn out. 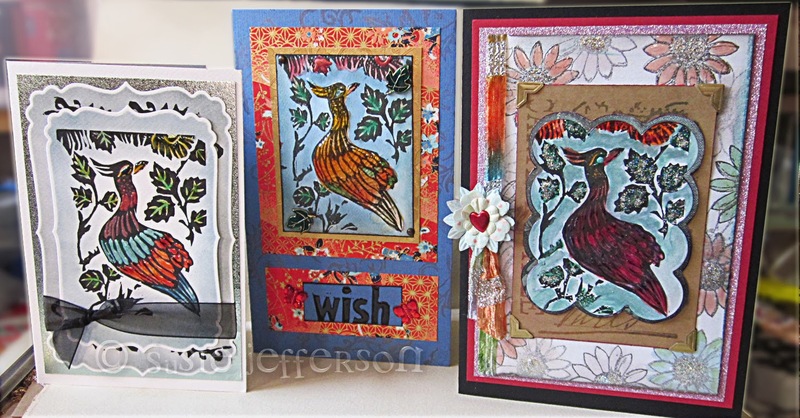 Such artistry...Love how you are able use them on cards with different mediums. Beautiful heart-art. Thank you so much! And thanks also for leaving a comment. These really are addictive - I've already done some more. Hugs, etc.